We believe in an uncommon approach that combines growth and protection. We will work with you to understand your needs and set your goals. While protection is the core building block to any grounded financial plan, there are additional ways to complement your risk management strategy to further help you grow and protect your assets. It’s important to build a financial plan that considers your goals, objectives, and concerns, and evolves as your life changes. There are many different sources of information, strategies to consider, investments to choose from, and decisions to be made. However, a singular mission meant to achieve financial balance that’s backed by an uncommon approach can help you take control of where you want to be. It’s important to have confidence in the strength and stability of those that stand behind you and your financial representative. Your financial representative utilizes Park Avenue Securities LLC, a broker/dealer that is an indirect, wholly-owned subsidiary of The Guardian Life Insurance Company of America (Guardian), which has a rich heritage of promises kept since 1860. 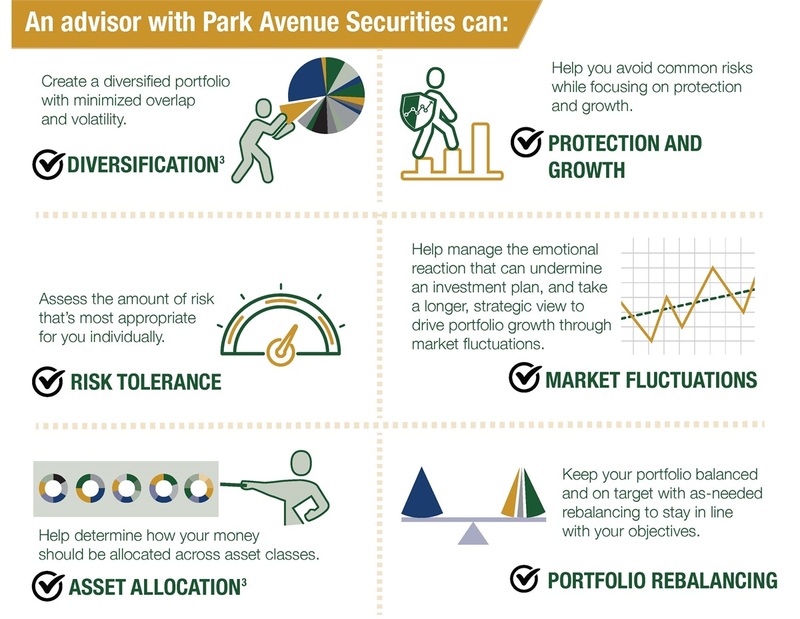 Park Avenue Securities is an indirect, wholly owned subsidiary of The Guardian Life Insurance Company of America. Member FINRA, SIPC. 1 The statement assumes $381 per month at 25 years old versus $5,778 per month at 55 years old to accumulate $1M by age 65. This represents monthly savings necessary using a 7% hypothetical rate of return (compounded). This is for illustrative purposes only and not indicative of any investment. © Morningstar. All Rights Reserved. 2 J.P. Morgan Asset Management; Dalbar Inc. Indexes used are as follows: REITS: NAREIT Equity REIT Index, EAFE: MSCI EAFE, Oil: WTI Index, Bonds: Barclays U.S. Aggregate Index, Homes: median sale price of existing single-family homes, Gold: USD/troy oz, Inflation: CPI. 60/40: A balanced portfolio with 60% invested in S&P 500 Index and 40% invested in high quality U.S. fixed income, represented by the Barclays U.S. Aggregate Index. The portfolio is rebalanced annually. Average asset allocation investor return is based on an analysis by Dalbar Inc., which utilizes the net of aggregate mutual fund sales, redemptions and exchanges each month as a measure of investor behavior. Returns are annualized (and total return where applicable) and represent the 20-year period ending 12/31/15 to match Dalbar’s most recent analysis. Guide to the Markets – U.S. Data are as of December 31, 2016. 3 Asset allocation and diversification do not guarantee profit or protect against market loss.